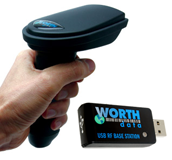 Worth Data USB Keyboard Readers allow the user to enter scanned bar code data into any application as if the data was being keyed in by the user. There are no software changes necessary to use this kind of bar code reader and the USB interface readers can be used on either a Windows® PC or a Mac. Just scan a bar code and the data will appear wherever the cursor is placed - it is that simple! Durable, entry level 1D bar code laser scanner with decoder built-in! The RF Cordless Laser Scanners transmit scanned bar codes wirelessly up to 500 feet to the B700 USB Base Station. Enter data into any application just like keyed entry — from up to 500ft away!